Pro-Palestinian activists protest at John Lewis. Mark Kerrison/Demotix. All rights reserved. Events have a far reaching impact. People share them on social media, writers and journalists report and visualise them, historians contextualise them, social scientists analyse them and philosophers and intellectuals interpret them. Recently, Israeli and international agencies extensively reported on the BDS (Boycott, Divestment and Sanctions) movement against the Israeli occupation. 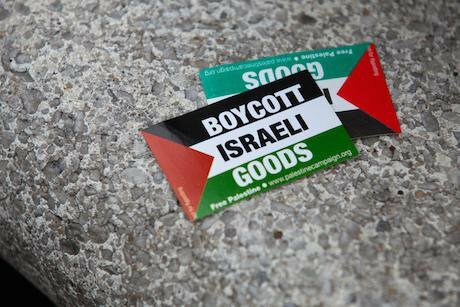 Back in 2005, BDS was founded by Palestinians to pressure Israel to end the occupation, adopting non-violent means. At the time negligible, if any, concern was paid to BDS and Israeli officials claimed it would not work. Nowadays, the Israeli far right and Zionists view BDS as an existential threat to Israel, calling for war against the movement and its activists. The main goal of BDS is to end Israel’s occupation and colonisation of Arab land; dismantle the Wall, recognise the fundamental rights of Arab-Palestinian citizens in Israel; and respect, protect and promote the right of Palestinian refugees to return to their homes and properties as stipulated in the UN resolution 194. The idea of BDS is admirable as a non-violent campaign, and the disappointment that motivated the call for BDS is clear. After more than fifteen years of negotiations, uninterrupted settlement expansion, increasing segregation and growing racism against the Palestinian citizens of Israel, there was a need for a new strategy that held Israel accountable for its actions, and pushed for a peaceful settlement between Israel and Palestine. I was extremely skeptical about the BDS movement’s agenda for a very long time. I was against boycotting Israeli products and academics, due to lack of official support from western governments and civil society organisations. Besides, my fear was that the aim was to engage Palestinians in collaborations with Israelis who reject the basic rights of Palestinian refugees in the diaspora, by seeking alternative and secondary solutions to prevent their right of return. Moreover, the ambiguity of BDS’ goals suggested that it was a weak initiative, in my opinion. However, after many years, I now see how effective it can be, as it engages those who support a one-state solution, like myself, as well as those who are in favor of a two-state solution. I do not define myself as a pro-Palestinian activist; rather, as a person who is Palestinian born to Palestinian parents, and who has inherited the legacy, culture and suffrage of Palestinians. Moreover, I adopt the notion of ‘Palestinianism’ where free men and women defend and stand by the oppressed against the violation of human rights everywhere. My views shifted last March, when I went, as a Swedish-Palestinian academic born in the Gaza Strip, on a visit to the Middle East. Our goal was to build cooperation networks with academic institutions in the region, which included Egypt, Jordan and Palestine. After prosperous meetings in both Egypt and Jordan, I traveled over Allenby Bridge to the West Bank (the only connection it has to the outside world) to meet scholars, independent researchers and professors at the three main universities in the West Bank. When I arrived at the bridge, I was supposed to cross the border with no restrictions. Even though I am a Swedish citizen, the Israeli army, intelligence and security agencies showed me how dreadful is to wait, be interrogated, yelled at, and inhumanly treated. What I witnessed at the hands of the Israeli authorities was horrifying, unbearable and unacceptable harassment. I was held for more than seven hours in a room where I was interrogated by the Shabak, Shin Beit, Israeli army and border control about myself, my family, my childhood, the purpose of the visit and how I got out of Sweden. They denied my entry into the West Bank under the pretext of “prevention of illegal immigration”. Seriously? And the second reason was my "security and public safety" threat. Do they really think that an academic could possibly be harmful and/or threatening? Is my pen dangerous? Or my Palestinian roots? This is one of the reasons I now support BDS. The other is Israel’s recent elections. By voting for Netanyahu’s radical far-right coalition, Israeli society is sending a clear message that they support racism, discrimination, and the occupation. But why I do believe that BDS may actually work? Durable and just peace and coexistence cannot be achieved by arbitrary and discriminatory policies, but by allowing dialogue through various channels. By denying Palestinian academics and students the right to travel to different parts of the world to pursue their academic journeys, Israel incites more violence and increases frustration among Palestinians. International political pressure on the Israeli government has not achieved anything. Non-violent pressure will affect every voter in Israel. They will only start to react to their government’s policies as soon as they themselves are affected by their own government’s policies and discriminations. When an Israeli academic is not invited to participate in a conference, denied opportunity to publish in academic journals under the name of an Israeli institution, then he/she will feel what it is like to be deprived of your basic rights. The same applies to businessmen who invest in the occupied territories, then sell their products as Israeli in Europe or the USA. BDS is the only option left for the Palestinians, their supporters and the international activists that defend a peaceful solution to these major human rights violations. We must expand BDS activities to engage as many people and sectors as possible. This message needs to be sent to every Israeli: they are paying the price for what they do to Palestinians. Yes, it may take ten or twenty years to achieve something tangible, but more than twenty years were lost as the Palestinians tried to negotiate their portion of the pizza—the West Bank. For real change to take place, every Israeli must feel the effects of the BDS movement, as peace is not achievable with a state that considers itself above international law.